As for many birders across Canada & the USA, Christmas Bird Counts have become an integral part of my holiday season. Since the idea was first introduced in 1900, these counts have become a pinnacle of citizen science, with more than 2000 taking place across North America and a huge database of important data dating back decades in many locations. There are a handful of such counts held across Newfoundland each year, and I have taken part ever since I started birding – often here on the Avalon Peninsula but also in central Newfoundland (where I usually spent the holiday season with my family before recently starting my own). 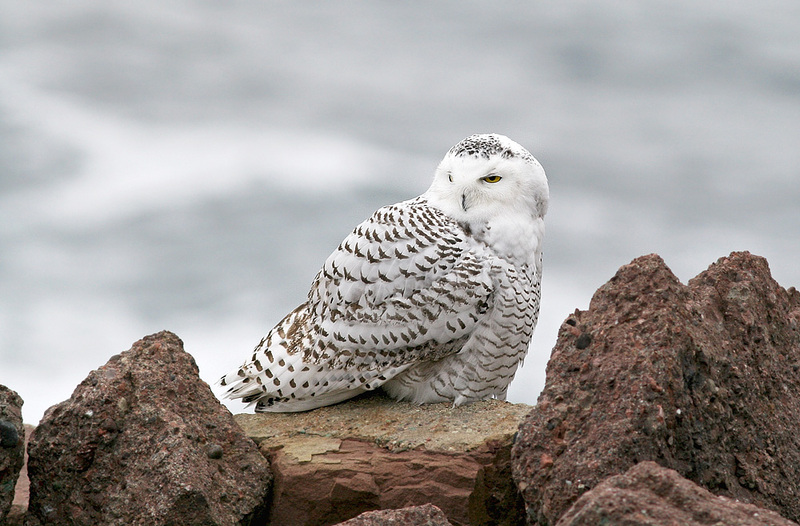 As every year, the St. John’s Christmas Bird Count was held on Boxing Day (December 26). However, unlike many years, the relatively cold and snowy weather of the past few weeks had a major impact on the results. The actual count day was beautiful – cold, crisp and perfectly clear. The sun shimmered off the fresh white snow and choppy ocean water. There was more than a foot of snow cover in most locations, and all the ponds, lakes and slow moving streams were frozen solid. It was definitely winter, and everything about the birds that were reported at the end of the day said just that. There were no real rarities, no southern stragglers like the few warblers that often get spotted on this count, and very few finches or berry-eating birds (despite great crops of cones & mountain ash). 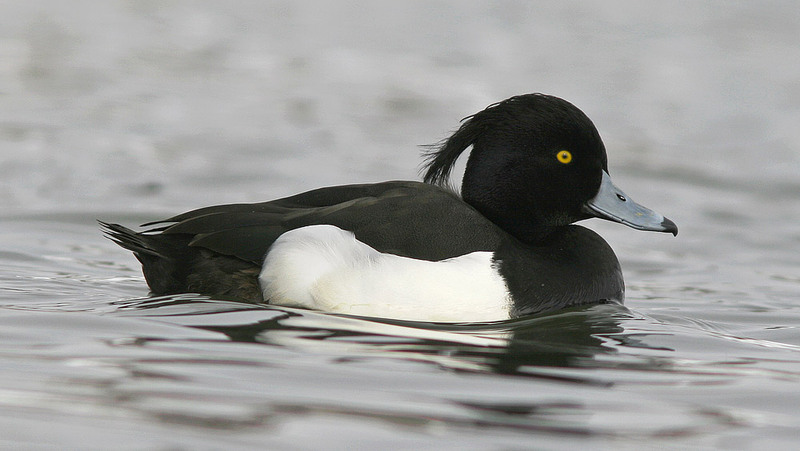 Despite an otherwise slow count, the St. John’s CBC resulted in a new North American record for Tufted Ducks – an increasingly common part of the city’s winter scenery! One highlight, however, was the excellent tally of 78 Tufted Ducks – a new record for this otherwise very rare species in North America! They have become a regular wintering duck in the city ponds of St. John’s, with growing numbers arriving each fall. This winter may prove to be a challenging one, however, as they compete with increasing numbers of other ducks around town in what appears to be less open water than most years. Space and food may be at a premium unless a mild spell opens up a bit more of the city’s many ponds. 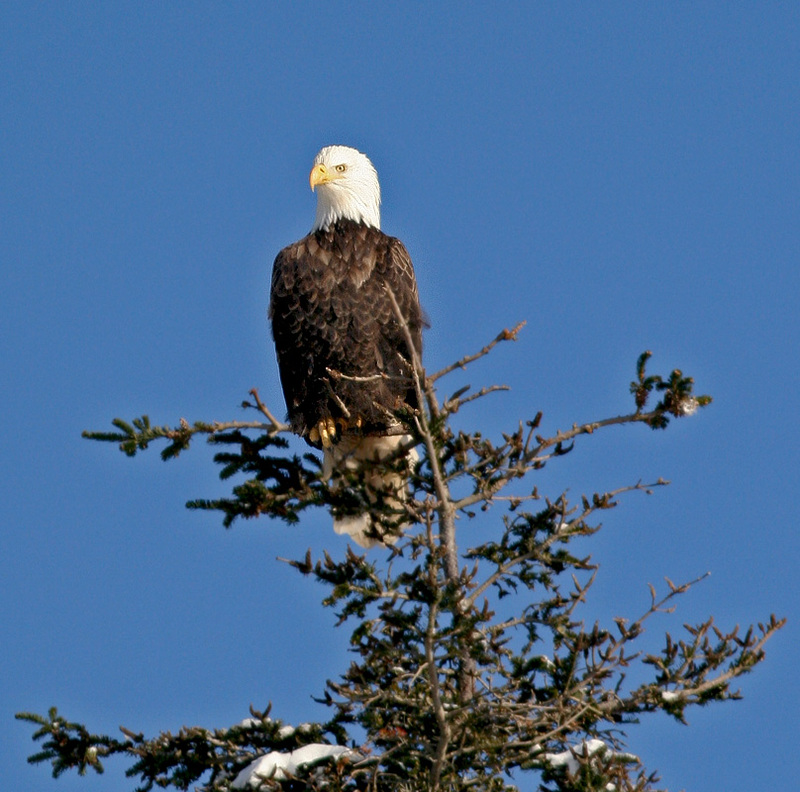 Bald Eagles have a strong presence in east St. John’s, especially in our CBC area that includes Quidi Vidi lake and the landfill (where we saw at least five individuals on this cold Boxing Day morning). Other mediocre highlights came from our own team (Bruce Mactavish, Ken Knowles and I), which covered the St. John’s landfill, Quidi Vidi lake, the harbour (the three hot spots for the city’s usually massive gull flocks) and some neighbourhoods in those areas. While overall gull numbers were a bit low, there were hundreds of Glaucous Gulls enjoying the cold winter weather, three Common Gulls hanging out at the harbour along with a couple thousand Iceland Gulls and several dozen Black-headed Gulls. The landfill also held a surprise in the form of eight Lapland Longspurs foraging on the snow-covered ground – a good bird for winter in Newfoundland, and giving amazing looks! 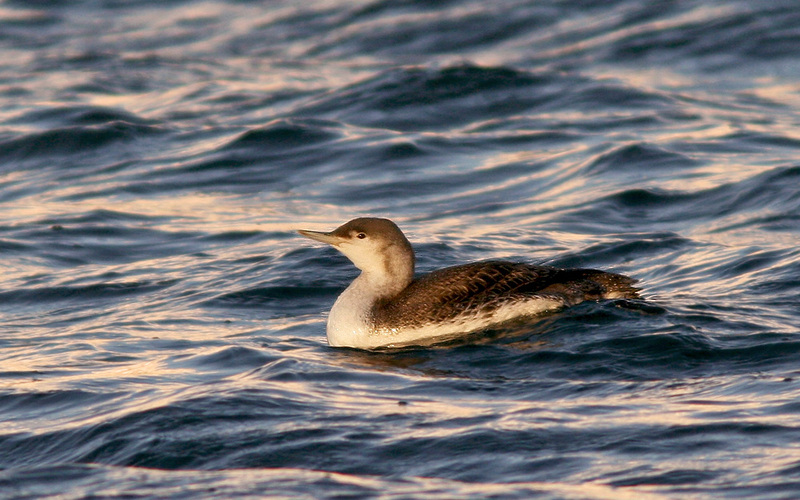 Even more interesting was a Red-throated Loon in St. John’s harbour – it, too, was giving great looks as it loafed in the water quite close to shore. 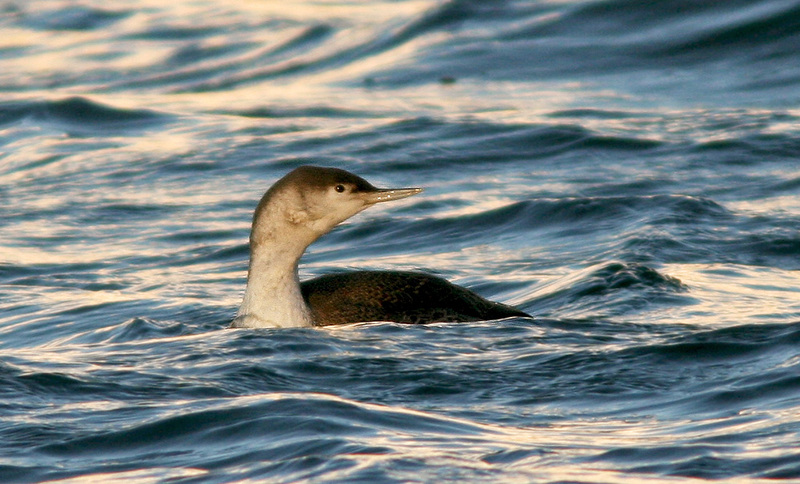 Red-throated Loons are uncommon in most of Newfoundland, especially on the Avalon Peninsula. 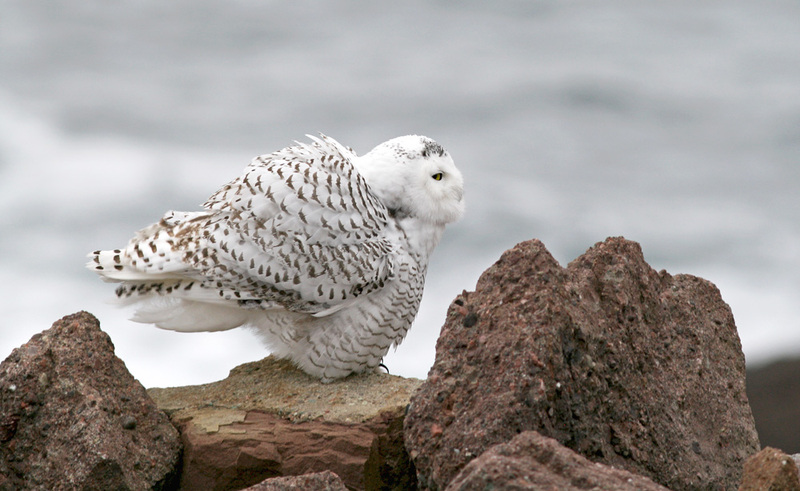 Seeing this one at close range right in St. John’s harbour was a little Christmas surprise. Although not much to squawk at it in their dull winter plumage, Red-throated Loons are a very elegant bird and always fun to see. While total numbers of individual birds and species were down this year, it felt like a “proper” day of winter birding – and great way to spend part of my Christmas holiday! 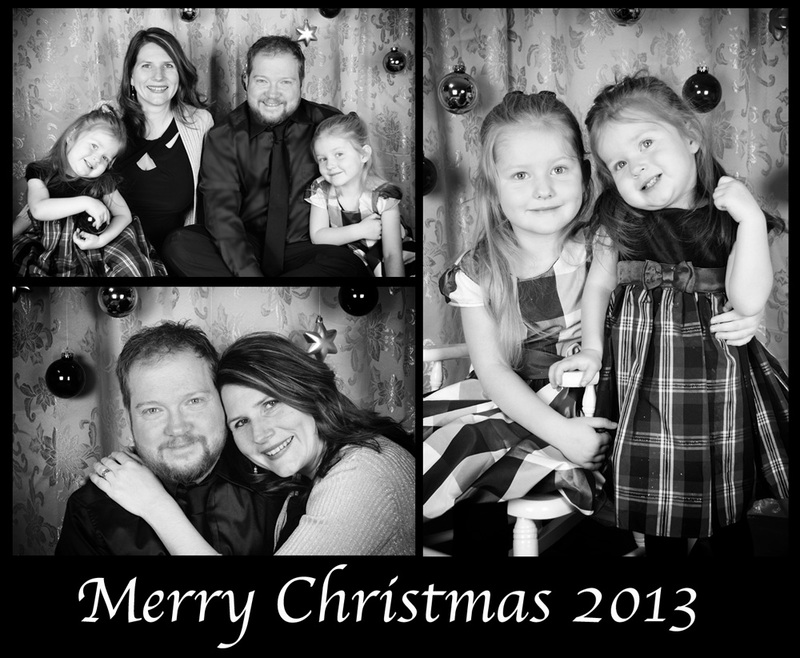 From our family to yours … happy holidays! Be they full of family & friends, spirits & cheer, birds & birding!! Is the relatively early onset of winter weather this year a harbinger of a long, snowy season ahead?? Today may traditionally be known as the “first day of winter”, but winter truly descended on Newfoundland weeks ago. Cold weather moved in during the first three days of December, and temperatures have been at or below freezing most of the time since. 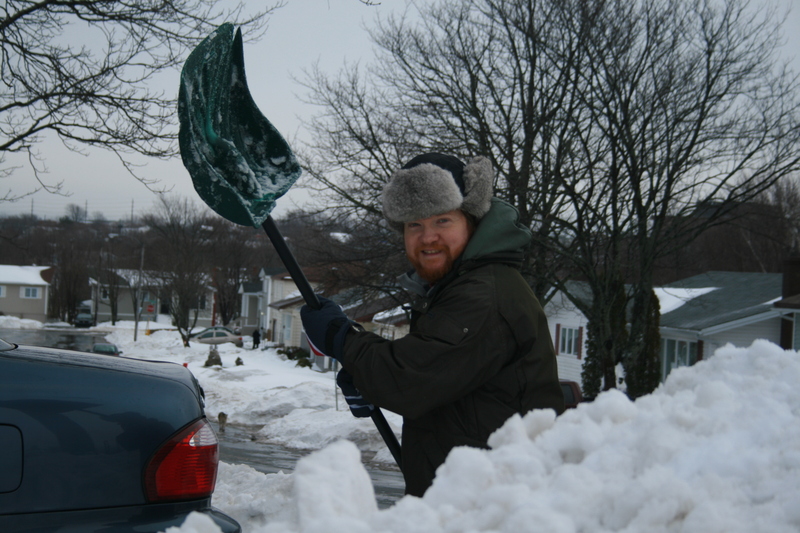 We have had several significant snowfalls in the first three weeks of December, and the entire island is blanketed in snow – even in relatively milder St. John’s which has seen plenty of green Christmases since I moved here sixteen years ago. In fact, this has been the snowiest December (most snow on the ground) since the winter of 2000-2001, which saw record-smashing snowfalls here on the Avalon peninsula. 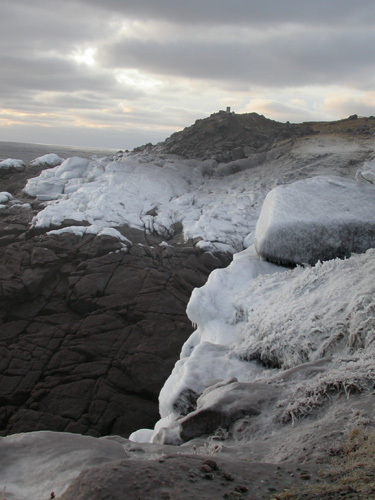 An early morning with snow and ice on North America’s easternmost rocks at Cape Spear. And while the Newfoundland winter bird list is almost on par with other years, actual bird reports for most of the month have been more like February than December when compared to recent years. Frigid weather has resulted in very few lingering migrants, especially warblers, that often get recorded in early winter. Early snow has blocked access to some locations including Cape Race and Cape St. Mary’s, forcing the cancellation of two key Christmas Bird Counts. 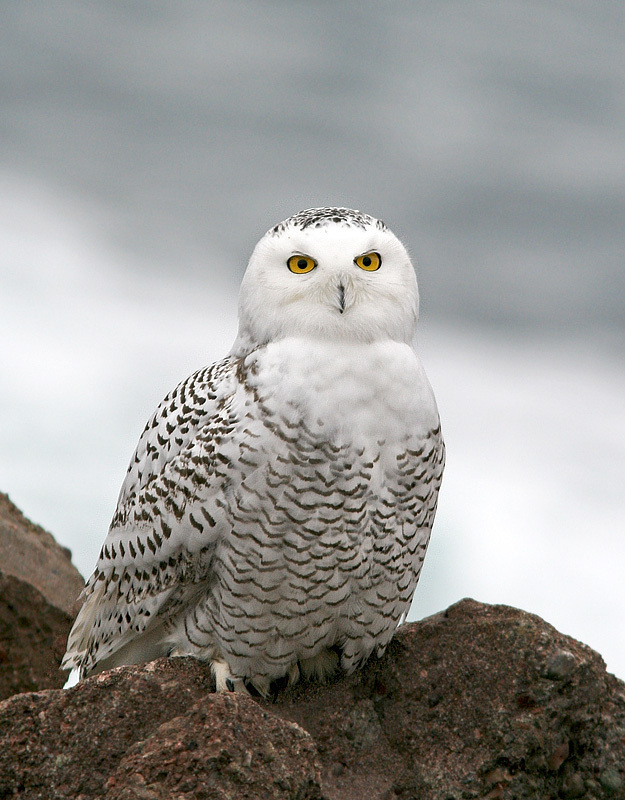 In true winter fashion, the biggest birding news so far has been the incredible invasion of Snowy Owls, with as many as 300 having been reported on the southeast Avalon in a single weekend. Newfoundland’s first Virginia’s Warbler survived long enough to make the winter list (last reported December 2), while a lingering Great Egret in northeast St. John’s braved freezing temperatures until at least December 11. And a Purple Gallinule found recently dead in a Clarenville backyard was about as close to southern flavour as we’ve gotten so far this season … and its untimely arrival was likely due to wintery weather in its own backyard. A Forster’s Tern at Renews on December 7 was only the seventh for Newfoundland, and just the second winter record. 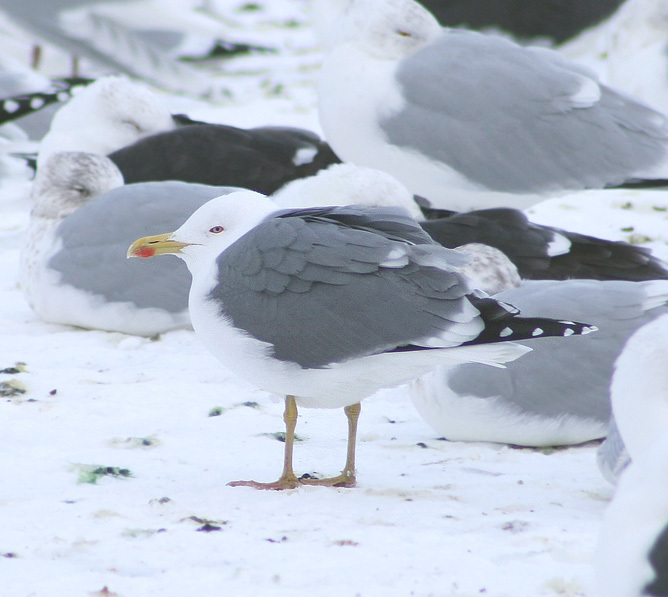 Despite being fairly elusive, the Yellow-legged Gull has been seen twice the past few weeks and should become more reliable now as the local ponds have frozen over and snow has covered other regular loafing locations for the huge flocks of gulls. So, as the hustle and bustle of the season continues and we head into Christmas, winter birding trudges on. Despite the cold weather and snow, there is plenty of hope and potential for exciting rarities yet to be discovered, the joy of winter birds returning to spice up our days, and the unwavering beauty of Newfoundland’s spectacular scenery to keep us smiling. Here’s to the magic of the season ahead!! 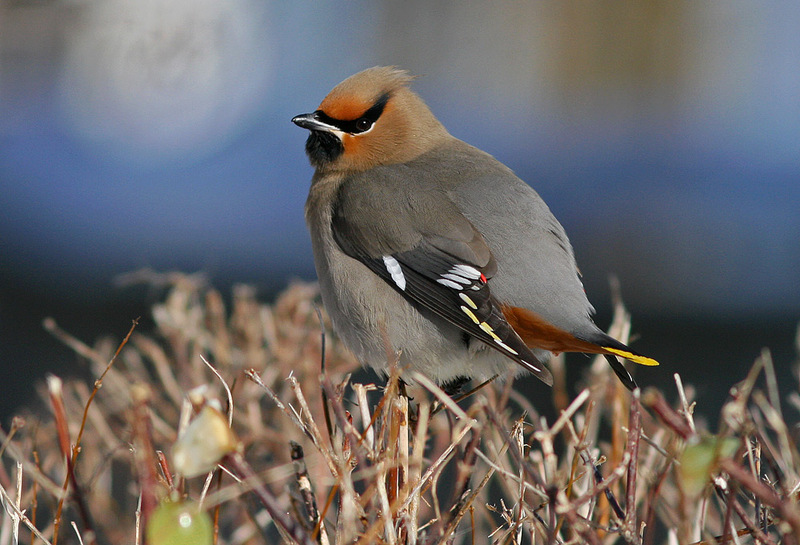 Winter brings with it the return of some spectacular birds – including one of my favourites, the Bohemian Waxwing. 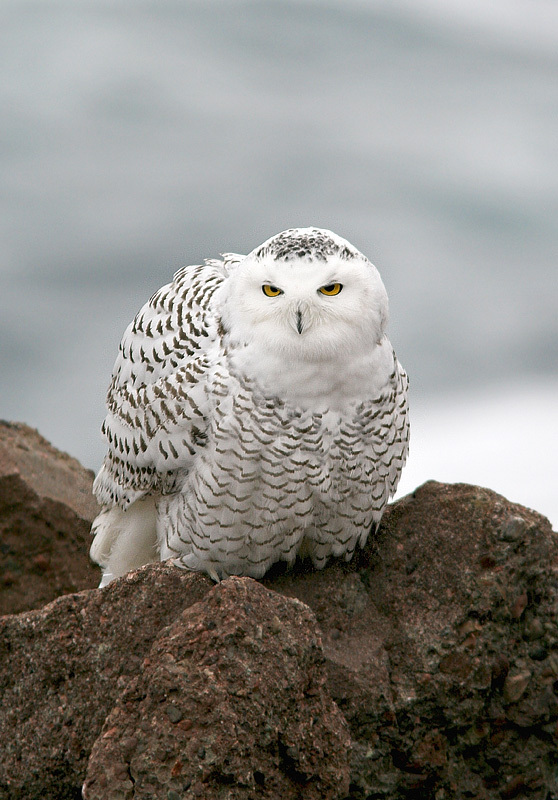 Nature news, social media and photography websites have been abuzz about the incredible Snowy Owl invasion happening in eastern North America the past few weeks. 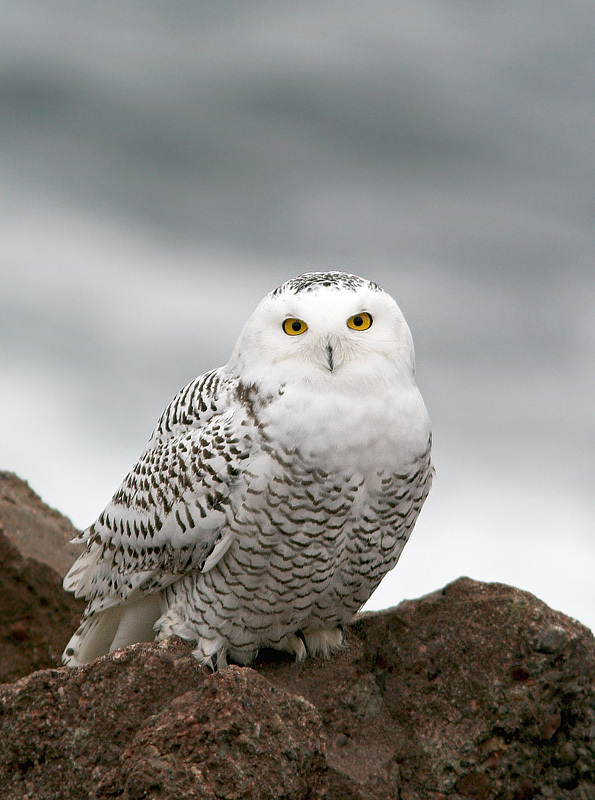 While the fallout has seen unprecedented numbers of owls reported across much of southern Canada and the northeastern states (with a few owls turning up much further south than usual), nothing compares to the explosion of these majestic arctic birds as Newfoundland’s Avalon Peninsula. Some keen observers have seen well over a hundred in the Cape Race area alone, while Bruce Mactavish tallied a mind-boggling 206 this past weekend. 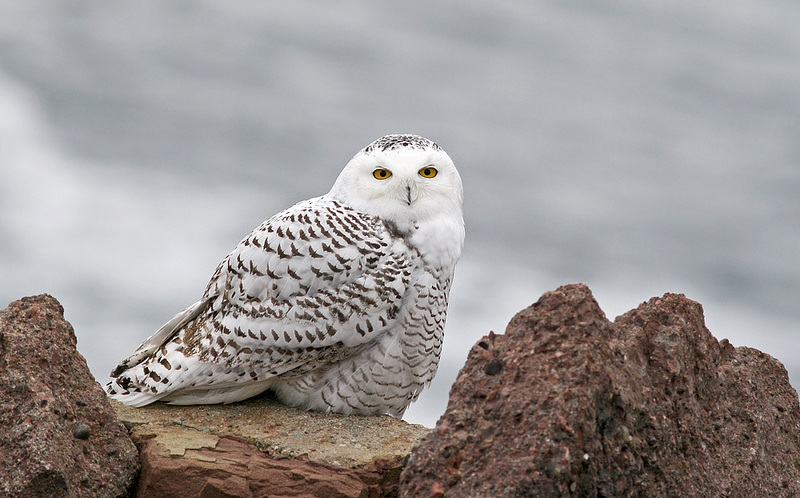 Snowy Owls have been making waves among birders all across eastern North America lately. 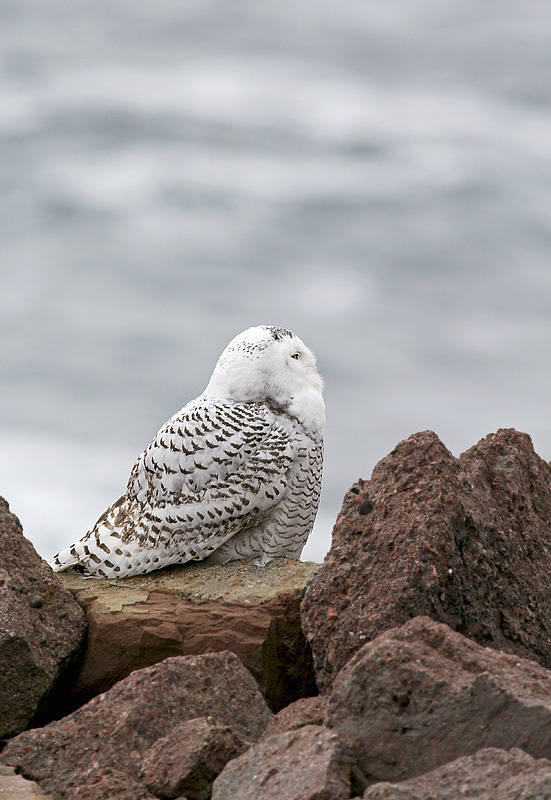 A few, like this one sitting on the easternmost rocks in North America, having been entertaining birders and non-birders alike at Cape Spear. Between work and family commitments, I haven’t had time to get out and enjoy this amazing spectacle myself. With that in mind, I decided to sneak away for just two hours on Saturday morning and head to Cape Spear in hopes of seeing and maybe photographing an owl or two. Cape Spear is the easternmost point in North America and just 15 minutes from St. John’s. A handful had been reported there daily for almost two weeks. I arrived and shortly discovered two owls hanging out near the point. A couple photographers were milling around, occasionally flushing the owls as they stood on the trail above them trying for photos (but, I’m happy to say, not harassing them – although I’m certain this has happened). Taking my own approach, I watched the owls for a few minutes and made note of their habits. After they had flown around the corner and the other guys followed them along the trail, I climbed down and positioned myself strategically between a couple perches I thought they’d like. And waited. After about fifteen minutes of enjoying the wave action and sounds of the ocean below me, one of the owls flew back around the corner and (just as I had hoped!) landed about 10-12m away. I didn’t have to move a muscle or disturb the owl in any way … it stayed for 20 minutes or so, posing and changing perches a couple times. What a wonderful experience! In the end, I saw a total of 7-8 owls in the area – most of those distantly as I scanned south along the cliffs and barrens leading away from the cape. The majority of the owls being seen appear to be hatch-year birds, indicating an excellent breeding season for the species this past spring. While I haven’t heard any confirmations, it is assumed that the populations of at least some small arctic mammals (e.g. 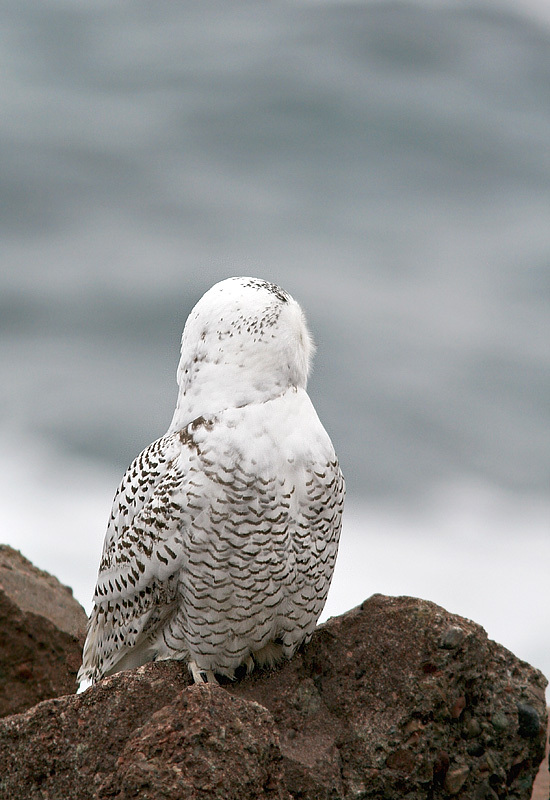 lemmings) that Snowy Owls depend on for survival must have experienced an abysmal crash, sending the owls south in search of food. 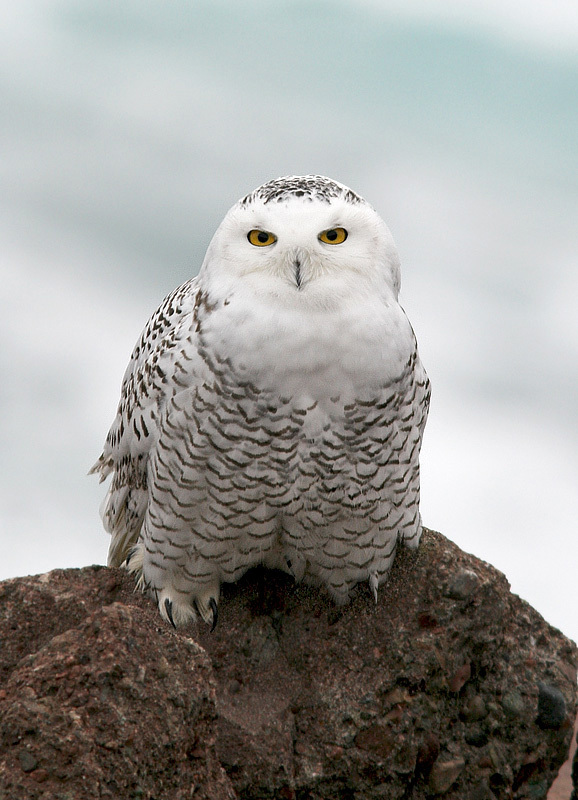 No doubt many of the owls being seen in eastern Canada and the United States originated in our own arctic, however there has been some question as to whether or not some or all of those being seen here on the Avalon might have come from breeding populations in (relatively) nearby Greenland. It’s an interesting idea. Either way, there is genuine concern that the barrens of eastern Newfoundland may not host a large enough rodent population to support the onslaught of these beautiful creatures, and their fate may not be so bright and rosy as we would like. At least one found dead this weekend looked emaciated and likely starved. A sad state of events, but also a somewhat natural part of the Snowy Owl’s population cycle (albeit often on a smaller scale than we might be witnessing at the moment). In the end, there is not much we can do but enjoy the beauty of these animals, appreciate what nature has given us, and let her take her course (even if that means trying not to think too much about it!). Expect me to write plenty more about gulls over the next few months – they are a mainstay of winter birding here in St. John’s, a draw for visiting birders, and possibly my favourite group of birds. Watching gulls requires a lot of patience and a good sprinkling of skill & experience. The ten or more species seen here most winters appear in mind-boggling arrays of white, greys, blacks and browns (yes – the young ones only add confusion) – not to mention the varying pinks, yellows and greens of bills and legs. Identifying them can be tricky for the inexperienced, and finding those “special” ones can be downright difficult. Especially in the case of the elusive Yellow-legged Gull, one or two of which show up here most winters. But one or two tricky birds in a city with tens of thousands of gulls — well, it can also be a needle in a haystack!! Such was the case these past few days, as a visiting birder from British Columbia and I combed through many masses of gulls to find just one. He had contracted my services as a birding guide to help him find the Yellow-legged Gull – it was head and shoulders the top of his priority list, with anything else just being gravy. Fortunately he had a few days, since I told him up front that finding it was far from guaranteed, and the chance of poor weather was always a threat. Very few people have been as fortunate to experience Yellow-legged Gull in North America as I have. And as a guide, I’ve had pretty good luck finding it for eager visitors – but it’s far from guaranteed. On this tour in January 2010, we finally found it on the very last day … a coup since it hadn’t been seen by anyone in several weeks! We ended up spending three fulls days in dogged pursuit. The first day (Sunday, December 1) was a lovely one to be outside … cool, calm and slightly overcast. But where were the gulls?!?!? We birded the standard areas from sunrise to sunset, with so few gulls being seen that I felt like a bit of a hustler — I was certain he thought I was pulling his leg when I said I had never seen such a lack of gulls in St. John’s at this time of year! But he bit the bullet and we went out again the next day – a cold, crisp one with just a slight breeze. There were lots more gulls … but they were spending their time loafing on the roofs of building around Pleasantville and bathing in Quidi Vidi Lake. Fortunately, I knew vantage points where we could see them and we ran the circuit – checking and re-checking the best spots all day. Not a hint of the bird. I could almost hear him thinking “Who does this guy think he’s fooling?” So, admittedly, I was a bit surprised when he called me up that night to arrange yet another day of searching on Wednesday – a day with a dismal forecast of high winds and rain!! The forecasters seemed to have it right when I woke up Wednesday morning – the wind and rain was lashing the back of the house. But by the time I got the girls off to preschool and we headed out to go birding at 9:45am, the rain had dissipated. I knew from experience that the wet, windy weather would keep the gulls off the the roofs and encourage them to flock on local grassy fields and ballparks. Sure enough, that’s where we started finding them. We scrutinized thousands of gulls over the next few hours, both on the fields and at the lake … but no sign of our elusive target. To my surprise, the clouds parted, blue sky emerged and at times bright sun shone down on us — and the gulls! As lovely as it sounds, bright sun makes gull-watching all the more difficult, casting hard shadows on the grass, bright glare on the water, and changing the all important shades of grey needed to pick out our bird. Still … we persevered, scrutinizing the gulls at each location from as many angles as we could. Sometime after 1:00pm we took our place on a hillside overlooking Bally Haly golf course, where (by my estimation) 7000+ gulls had set down for a rest. A small flush erupted as I set up my scope, and I noticed someone with binoculars walking across the golf course to scan the flock (someone I did not recognize). I rushed to scan the flock in case he continued to disturb them — about fifteen second and 500 birds later, that “magic shade of grey” caught my attention. Then the gleaming white head!! I HAD IT!! I was just getting our visitor on the bird when the guy on the field began to walk away, waving his arms as he went in an attempt to flush the gulls!!! Fortunately, only those closest to him paid any heed and the gull stayed put. Although it slept most of the time, we got prolonged looks and ample time to to study the unique shade of grey and white head, and occasionally the head and bill shape as it lazily lifted its head. It stood up just a couple times (once as an unknown presence caused a mass flush that filled the sky with every gull on the field!) — enough for us to see and appreciate those magnificent yellow legs for which the bird is named. Although yesterday’s Yellow-legged Gull was much too distant for photos, this one (photographed at the same location and similar date several years ago) shows that “magic shade of grey” and clean white head that first caught my attention and helped it stand out amongst a myriad of other gulls. 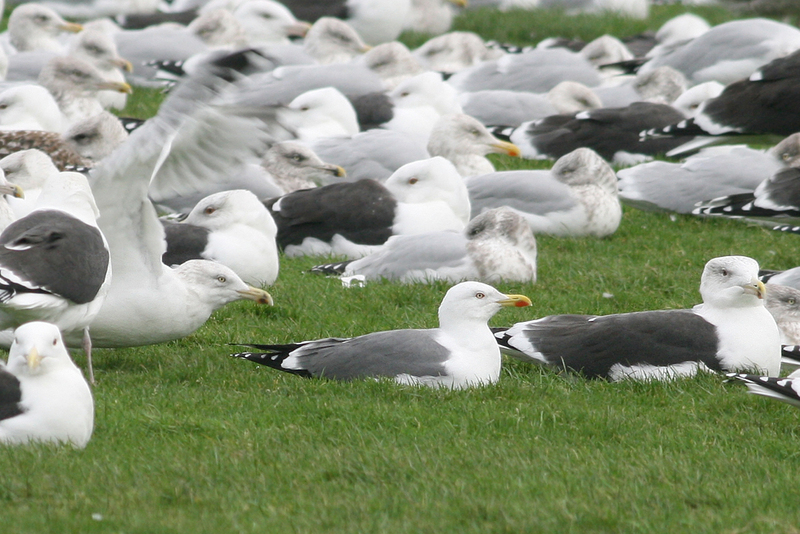 The mantle is intermediate between Herring and Lesser Black-backed Gull, and combined with other features like unique head shape, thick, blunt bill and large red gony spot, helps an experienced gull-watcher pick out this needle-in-a-haystack rarity. Yellow-legged Gull !! And another happy customer who now understands the value of patience and persistence when hunting for those hard-to-find, tricky-to-identify rare gulls of St. John’s!! BTW – The only other sightings of this gull in the past number of weeks were two ABA Big Year birders Neil Hayward and Jay Lehman, who also spent much time and effort in finding it. They were fortunate! !